Sick of imagining what your LEGO could do if it were alive? Think again. Now you can Bring your actual LEGO creations to life within a digital gaming experience. LEGO have created an immersive experience where users are able to convert their LEGO sculptures/designs to virtual gaming characters. The idea is simple; build, connect and play. The tech is fairly simple. 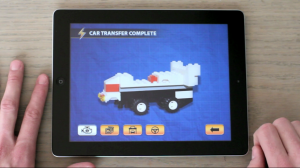 Bricks are comprised of tiny sensors which essentially allow the bricks to communicate with one another wirelessly to mobile devices (IPad or iPhone) with the corresponding LEGO APP. The app allows the physical LEGO pieces to come to life in a virtual gaming experience that sure beats the traditional approach. This is a fantastic innovation by LEGO and we look forward to witnessing how other brands and retailers apply similar thinking and technology. interesting… so if I swallow a piece can I race it through my digestive tract! Now we are talking something different! WOW how Leggo has come a long way and it goes to show if the concept is great to begin with, it will last for years to come and keep evolving!! I am only writing to let you know what a fantastic experience my princess found visiting your web site. She picked up too many issues, with the inclusion of what it’s like to possess an awesome teaching mood to have many people with ease know precisely chosen extremely tough things. You undoubtedly did more than my expectations. Thanks for supplying such informative, dependable, explanatory not to mention unique tips on that topic to Kate. Have you ever thought about including a little bit more than just your articles? I mean, what you say is fundamental and all. Nevertheless imagine if you added some great pictures or videos to give your posts more, “pop”! Your content is excellent but with pics and videos, this site could undeniably be one of the greatest in its niche. Good blog!